Thank you for all your input guys! I'm still at it, working on the HUD. Unfortunately, I gotta say option 2 is out. 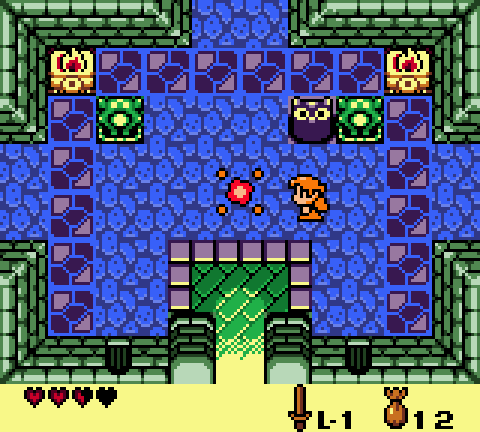 During all my testing, I forgot to go into a dungeon and didn't realize the dungeon map would cover up the rupee counter. Silly oversight, indeed, and my apologies for the mistake. Alternatively, why have a rupee counter in the item menu at all? Rupees are only relevant inside shops and you already have a rupee counter in your HUD. There's no reason to see them in the item menu that I can remember. Well, the HUD you see while walking around is what I'm trying to make nicer. Having 20 hearts, a rupee counter, Slot B and Slot A, makes it feel cluttered. With only 1 tiles worth of space remaining, there isn't much room for layout improvement. So that's why I'm considering removing the rupee counter from the HUD, and having it in the inventory screen only. My thought was similar to what you and retroverse said, that there isn't much need for the rupee counter to be available at all times. With it gone from the HUD, it's more aesthetically pleasing, but you'll have to open the inventory screen to check your rupees. My hope is that this doesn't become a hassle. There is still room for improvement, so all feedback on this will help immensely! Ah. I partially misunderstood. 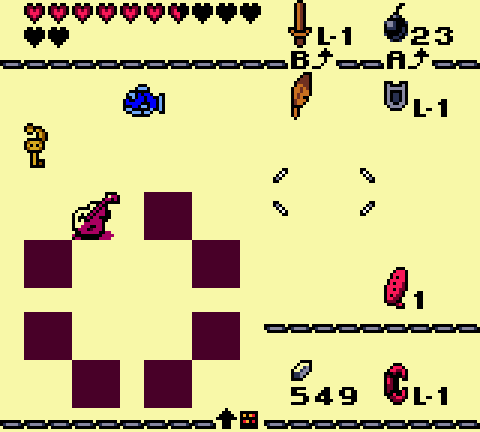 I don't suppose having a sprite based rupee counter that only pops up in shops and when you gain rupees is an option? That would be pretty cool. If I can find a clean way to implement that I totally will. I have attempted to extend the visible boundary so the HUD would overlap with the world, instead of being in its own little white border. 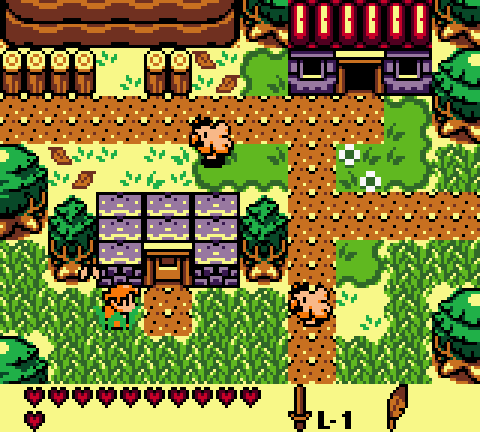 Lots of issues, of course, but it'd be nice to have a HUD similar to ALttP. To me, it would be option 2. Finalized the heart expansion to 20. Last I posted, the file selection screen still only displayed the original 14 hearts. Now it shows all 20 hearts! Still working out the placement for the rupee counter. I liked both options 2 and 3, but they both had their downsides. (option 2 being covered by dungeon maps, and option 3 appearing squished between other things) I feel there is a better solution somewhere, so I'll make an update when I come up with something. Thanks for all the feedback on it! I have now registered on this site after lurking for a while. Just want to say how much I am looking forward to the completed game. The idea and the screenshots are fantastic. Keep doing what you are doing IcePenguin! This is a nice little community here too. Do you think you could have the counter floating in the top right corner of the screen or just above the hearts in the bottom left corner with a 1 pixel stroke? I get that you're trying to declutter but maybe spreading things out isn't such a bad idea. Mariachi, welcome to RHDN! Thanks for the encouragement. Really does keep me motivated. Shade Aurion, I've tried to get a "floating" HUD in the past, but the game just doesn't like it. It always crashed in my attempts. It has been a couple of years since I experimented with it, though, so maybe I'd have better success now. I know a lot more about the game than I did then. I'll see what I can do, but it will most likely stay somewhere in the inventory screen. I could probably rearrange the inventory screen. Those instruments take up too much space. The spin attack now cuts underneath Link's feet, like it does in the Oracle games. Changed the layout of the entire inventory. For two reasons. One was to find good placement for the rupee counter, and the other was to make the hearts left-aligned on the screen. It just seemed odd to have your initial 3 hearts in the middle. 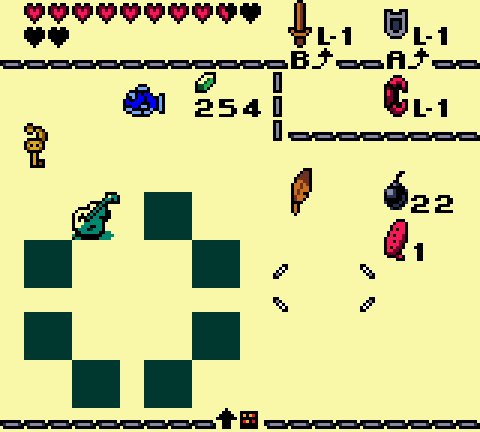 The only thing I would do different is have the AB Equipment on the bottom of the screen and the Rupees/Bracelet on the top. Feels more natural that way. Oh, great idea! I will rearrange it and see how it looks. Thank you for the suggestion! Quickly rearranged the layout to what you suggested. Does look a lot better, so thanks a bunch! The empty space by the bracelet could be used by another (maybe) passive item. Not sure what, yet, but I have some ideas. There was enough free space for me to make at least one new item, so maybe I can squeeze in another. Also, with this layout, makes it more clear that the bracelet is auto-assigned to the A button. Which is explained in the town library, just in case. Nice to see you back kickin Icepenguin. Really like the new layout of the Equipment Screen, even though I would like so see the sides switched to keep the layout closer to the original one, maybe I am just a bit to much of a traditionalist here. Love the regular updates lately, keep up the great work. Really appreciated. This looks absolutely amazing so far, keep up the good work. I wonder if it's possible to make the instruments closer together so they don't take up so much space? The latest changes to the menu look great! May I ask what is the hack's goal exactly? Is it a brand new hack with new story, dungeons and such for Link's Awakening or is it some sort of improvement hack (QoL) for the original Link's Awakening? Also, damn IcePenguin you really do hacking wonders! You could literally line them up instead of having them in a circle to save a bunch of space that way but then again, i'm surprised you have the instruments at all. It could be 8 of anything really so long as it serves the purpose of your story. Hell, Marin could even use a staff instead of a sword if you wanted. I actually really like the hearts being top left in menu (and assuming bottom left outside of the menu) it looks really good. As for the empty space next to the bracelet, perhaps you should make 4 passive slots (Bracelet L-1, Tunic or dress L-1, Flippers and maybe the Magnifying Lens?) and move those items into the area with keys, potions, trade items, etc. In fact maybe put all those items (keys, potions, trade items, etc) below the passive item slots so passive items could link to the item slots in a way. As for keys, you could just have a keyring that displays other keys when its hovered over and have custom keys rather then the typical Link's Awakening set. This may end up being a long post, but looks like there is some stuff I gotta explain. I'll start by talking a bit about this project's ultimate goal, as ShadowOne asked about in his post. My hope and goal for this project is to make 2 fully complete games using LA as the base. Similar to how the Oracle games were released as a duo, that's what I plan for this project, as well. One game will focus on Marin, with everything you've seen up to this point being screenshots from her game. The second game will focus on Link, but I haven't shown anything from his game. Both games will take place on Koholint Island, but will both be vastly different. Marin's game will take place on Koholint Island as she knows it, so a lot of things will remain true to the original game. The logic behind that is similar to how dreams work in real life. Recurring dreams often have things that are familiar, but also come with unexpected differences. Being an island that exists within the Wind Fish's dream, some things will look the same, but other things will be completely new. So that's my thought process when creating Marin's game. For Link's game, he will be on... another Koholint Island. Since, you know, not all dreams are the same. I don't want to spoil anything or show any of it until the game is released, so it will be a complete surprise. Keep in mind that not every element will be totally new in Link's game. I have to keep my ambition realistic, so I don't get in over my head or burnt out. I am only a meager rom hacker, but I shall do my best. Thanks for the support! I know how you feel about being a traditionalist. It may take even me a while to get used to the new layout. But I think it is worth it because having the hearts left-aligned looks so much nicer. Then at the same time, I think all the equipment should remain in the same columns. I dunno. Nothing is final, yet! Ha ha. I could totally make them closer, but there are some things to consider, though. It's probably best to keep them within the bounds of space used by the dungeon map. They don't have to be, but if I moved them somewhere else, that space would go completely unused in dungeons. So I'm tying to design a HUD that uses all available space. I'm glad you like he 20 hearts! Something the gameboy Zelda games really needed, in my opinion. While I understand the limitation and why the original didn't have 20, I always wished they could have 20 like every other Zelda. And yes, these games will have new story, dungeons, items, and other stuff! Thank you for nice words! Thanks for all the suggestions! The more the better. It really helps spark creativity. I really like the idea of Marin using a staff. Ha ha. Regarding the instrument layout, I have to keep in mind the space used for both the main island inventory and also the dungeon inventory. As I mentioned to Nimpak, it's probably best to keep the instruments confined within the space used by the dungeon map. A lot of space would go wasted if they both used different spaces. Thanks a big bunch for everyone's feedback! To end this post, here is a screenshot for dungeon 1. I mentioned this briefly in an earlier post, but the owl statues are now save statues and will be at every dungeon entrance, as well as various points across the island. Travel to one if you want to save your game. The reason I implemented these is to prevent save abuse when purchasing items at the shop, and also because I liked the save mechanic in Majora's Mask. My pleasure! I'm glad I could be of help. Jeez, I love that layout more already. I'd suggest putting at the top of the screen but i'm pretty sure it wouldn't look as nice. I love the idea of save statues too. Awesome to hear about a second game. HYPE! Will Marin collect something in place of secret seashells? Maybe memory fragments or something.. Or like Tears of Light from Twilight Princess. In Link's Awakening Prince Richard from 'The Frog For Whom The Bell Tolls' (a game that Toruzz is currently colorizing) made a cameo so maybe you could switch him out for another character from that series or have him joined by another one. Its often the little things that add polish. That game might also have some useful sprites for you to utilize as its made in the same style as Link's Awakening even sharing a font type so it'd be worth checking out. You mentioned the Ocarina earlier too and it got me thinking, perhaps you could have Marin learn songs to sing instead? The singing sprites are there to use so it should be easy enough to trade out the animation and then you could give them all sorts of functions. Haha, thank you! Getting the HUD to the top of the screen is definitely more trouble than it's worth. I have tried to do this in the past, but it seems really complicated. I have successfully moved the HUD to the top, but it's just not as simple as that. Then you have to account for the visible display of the screen and shift all the tiles down, which I never figured out a way to do. If I find a way, though, I will do it. I've always preferred the HUD at the top since the Oracle games. In regards to all your questions about story, and all that, I will say that Marin's game is a sequel to Link's Awakening. Currently, Marin will be collecting seashells, and the trading sequence will be completely new. That part is already complete, actually. Using Richard would definitely be cool. That's something that really intrigues me, but I won't say much on that. As I read your post, I start to wonder what I've been doing this whole time, ha ha! You have a lot of interesting ideas, that's for sure! It probably doesn't seem like I've done a whole lot, since I show very little, but there has been a lot done over the years. I never imagined I would still be working this for 5 years, but I'm glad I haven't rushed it because it's made huge leaps from what I initially planned. The project is a lot bigger than I realized! Two games!? Do you have an intended order of completion in mind, or would it be like the oracle games where it doesn't matter which one you complete first? You'll be able to complete them in any order. I have tried to make some interactions between the two, making a play through of one have benefits in the other. Nothing as complex as a password system like in the Oracle games, though. It's unfortunate, but they will most likely have no special features like that, but it would be really cool!